We have developed eddy current NDE systems which make use of High Temperature (HT) Superconducting Quantum Interference Devices (SQUIDs) as magnetic field sensors. Due to their high field sensitivity even at low frequencies, SQUIDs are especially suitable for applications, where a large penetration depth is required. We used 3 GHz rf SQUIDs made from YBCO with a field resolution of about 1 pT/ Hz in our systems. In order to obtain a high dynamic range, gradiometric excitation coils shaped as a "double-D", and in some cases also circular field coils with local compensation of the excitation field at the SQUID by a second coil were used to excite eddy currents. We have set up two different SQUID based eddy current NDE systems, one of which is optimised for testing aircraft wheels. It consists of a fixed cryostat, which contains liquid nitrogen as coolant for the SQUID, and is mounted close to the outer surface of the rotating wheel. The second system can test planar objects. A motorised x-y-stage moves the cryostat containing the SQUID above planar samples. Here we could detect in aluminium plates flaws with lengths of 40 mm, having a height of 1.2 mm in a depth of 26 mm. A comparision between conventional eddy current systems and the SQUID based system shows an improvement in the signal to noise ratio of up to 3 orders of magnitude for cracks deeper than 13mm, when using the SQUID system. *This work is supported by the German Federal Ministry of Education and Research (BMBF) under Contract No. 13N6677/8. Recent research in SQUID based NDE systems [1-6] has proven their superiority over conventional systems when searching for cracks in depth of 10 mm or more . Since SQUIDs in general have a very high magnetic field sensitivity, which is nearly independent of frequency, the advantages of a SQUID as magnetic field sensor are especially pronounced for applications where a low excitation frequency is required. Additionally, the high bandwidth available with certain SQUID systems make measurements over a wide frequency range possible without having to change the sensor. The high dynamic range (the ratio between the highest field change which can be measured before the system goes into saturation and the lowest detectable field) of typically 140 dB/√Hz or more allows one to detect small field changes in the presence of large background fields, produced e.g. by edge effects or inhomogeneities in conductivity. We have focused in this work mainly on the development of a low frequency SQUID system for the detection of deep lying defects, where we concentrated on aircraft parts like multilayer structures, rivet plates and wheels. The detection of deep lying flaws introduces some difficulties: First, the skin effect implies that the deeper the crack is located the lower the excitation frequency has to be in order to obtain a maximum current density in the vicinity of the crack. Secondly, due to the induction law, the induced current density decreases when lowering the frequency and thus the corresponding magnetic field generated by the crack is decreased as well. For low excitation frequencies the penetration depth is high, however, since the eddy currents spread over a larger area for lower frequencies, the spatial resolution might then be too low for practical purposes. Due to the frequency dependence of the induced current density there is a certain frequency at which the eddy current density at the location of the crack is maximum, but the spreading of the eddy currents is still sufficiently small to obtain a reasonable spatial resolution. 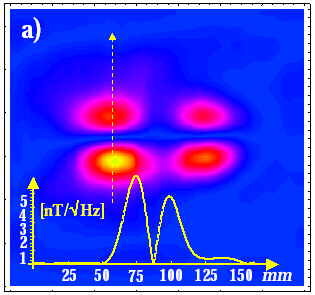 To be able to simultaneously detect both, cracks at the surface and in a depth of 10 to 20 mm, the dynamic range of the NDE system has to be at least 120 dB for integration times of 1 s. Since a reasonable SQUID system has a dynamic range of 140 dB/√Hz or more, an even shorter integration time and thus faster scanning is possible. The detection coil used in conventional systems is replaced by a SQUID sensor which usually measures the vertical compoent (z-component) of the magnetic field above the sample under test. In our experiments we have used HT rf SQUIDs made from YBCO thin films [8,9], which are operated at 3 GHz. The field noise of these sensors is about 1pT/ z, at signal frequencies above 1Hz. A simple dewar is used for cooling the SQUIDs down to 77K. We have setup several prototypes for NDE testing, one for testing aircraft wheels, and another for testing planar samples like pieces of an aircraft wing. The latter system makes use of two different motorised x-y stages, which are used for two dimensional scanning of flat samples. One of them provides a scanning range of 1m2 and a scanning velocity of up to 20 cm/s. Here the dewar is mounted to the moving part of the x-y stage. For smaller samples another x-y scanner moves the sample under test below the fixed cryostat, which gives smaller vibrational noise, however in our case confining the scanning range to 20 cm x 20 cm and the scanning velocity to 4 cm/s. For measuring the z-component of the magnetic field above a flat test object, the SQUID is attached horizontally to the bottom of the sample holder inside the cryostat. The distance between SQUID and room temperature sample is about 7mm. For testing aircraft wheels, we used a different setup, where the wheel is rotated by an electric motor with a speed of 6-20 rpm. The SQUID is vertically placed inside a glass cryostat, which is mounted close to the outer surface of the rotating wheel. In both cases, the excitation coil is attached to the outside of the cryostat between sample and SQUID. The SQUIDs did not need any magnetic shielding for reliable measurements. The read out electronics allows dc-variations in the range of  60 T and has a slewrate of up to 5 mT/s. In the case of measurements with a dc SQUID we used a different type of readout electronics which exhibited a slewrate of up to 1T/s. Measuring the system noise in unshielded environment resulted in a field sensitivity of about 2 pT/ Hz at frequencies above 100 Hz. All systems are controlled by a PC using a 16bit analogue to digital converter (ADC) to record the SQUID response at the output of the lock-in amplifier. To realise an as high as possible dynamic range of the SQUID system, we had to use a gradiometric excitation coil having the shape of a double D , which in the centre of the coil ideally has zero excitation field. When the SQUID is placed above the centre of the coil, it sees only a fraction of the excitation field which the sample under test experiences. 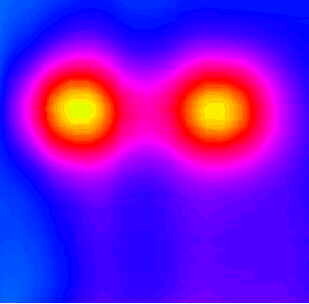 Also, a low field at the location of the SQUID is obtained, when a circular (absolute) field coil is used, but the excitation field is locally compensated by a small (r < 1 mm) compensation coil close to the SQUID. Since this compensation coil is relatively far away from the sample, it will only reduce the excitation field at the location of the SQUID and not at the sample. In both cases we achieved a reduction of the excitation field at the location of the SQUID of up to 1000 compared to the field at the sample under test, which increases the dynamic range by six orders of magnitude. Although the dynamic range of the SQUID-system (140 dB/ Hz in unshielded, 156 dB/ Hz in shielded environment), that of the excitation field (138 dB/ Hz) and that of the lock-in amplifier (125 dB/ Hz) are more than sufficient for all kinds of measurements, we are currently limited by the 16 bit resolution (dynamic range: 96 dB) of the ADC used for data conversion. In Fig. 2.1 we show a linescan above the edge of an aluminium plate, which nicely demonstrates the large dynamic range of the SQUID system. The total field variation across the edge is about 1 µT (Fig. 2.1 a). Inspecting the noise on a more sensitive scale (Figs. 2.1 b + c) yields short range fluctuations of a few pT. For even more sensitive measurements, the maximum measured field variation must not exceed 100 nT, because of the limitation of the dynamic range by the ADC. An 18 or 20 bit ADC, which are commercially available now, should solve this problem. Fig 2.1: Linescan across the edge of an aluminium plate. Double-Dcoil:: Ø:30mm, 400Hz a): full usable field range b and c): more sensitive scale showing the magnitude of the system noise. For the efficient detection of deep lying cracks we carried out simulations for optimized excitation frequencies  In case of aircraft aluminium samples with a conductivity of 16.5-20.5 MS/m, the optimum frequency for cracks in different depth were calculated, mainly for excitation with a double-D coil with 30 mm in diameter. For example a crack in a depth of 9 mm can be found with highest signal to noise ratio, when using a frequency of 260 Hz. Fig 3.1: Calculated and measured field strength for a 40 mm long and 0.6 mm high crack in different depths. 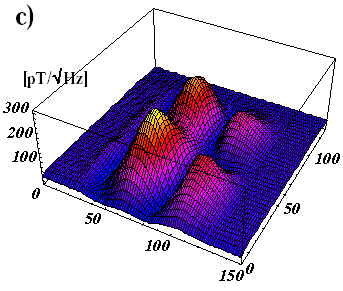 Figure 3.1 shows the expected magnetic field at the surface of the sample caused by cracks in different depths, assuming that the optimum frequency for each depth was used. The circles in Fig. 3.1 represent the measured values for a 40 mm long crack and 0.6 mm high crack. There is an excellent agreement between measured and simulated data. 1. edge- and liftoff effects; 2. vibrations during scanning; 3. varying conductivity in the sample under test; 4. thermal noise generated by the sample; 5. noise of the SQUID system itself. The following figures demonstrate measurements of cracks in depths larger than 13 mm. 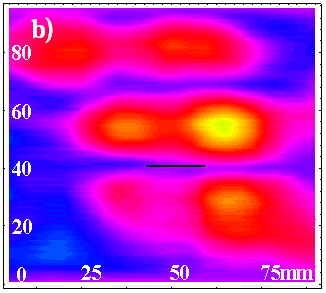 Fig 3.2 (a) shows the field distribution above a sample with a 40 mm long and 0.6 mm high crack below an aluminium plate with 13 mm thickness. Depending on the variation of the conductivity of the covering plate, a substantial background occurs, which limits the reliable detection of deep lying and small cracks (Fig. 3.2b). By means of a larger double-D excitation coil and higher excitation fields of up to 0.5 mT (Ø: 45 mm, 200 turns, 200 mA, 80 Hz), a 40 mm long and 1.2 mm high crack could be detected below two plates with a thickness of 25 mm in total, in which the field variations caused by variations in the conductivity of the plates were smaller than 40 pT. Finally we have performed some measurements to compare the SQUID system with an eddy current system based on conventional induction coils. For these tests we used a sensitive conventional system (Elotest B1) with a pick up coil without ferrite core (PLA-44). The test sample had a small flaw at a depth of 13 mm. Although the maximum amplification was used (pre: 24 dB, post: 60 dB) the crack was not visible in a bandwidth of 30 Hz. We therefore performed an A-scan in a bandwidth of 2 Hz (Fig. 4, right), and observe a response with a signal to noise ratio still below 3. Figure 4, left, shows a measurement of the SQUID system. Although a bandwidth of nearly 50 Hz was used, the resulting signal to noise ratio was better than a factor of 100 compared to the conventional system. In order to detect deep lying defects like the one in Figure 4 with a conventional system, large pick up coils have to be used which result in a decreased spatial resolution. The spatial resolution of the SQUID system is limited only by the distance between sensor and sample (about 7 mm) or the diameter of the excitation coil, which can be adapted to the thickness of the sample without an appreciable loss of sensitivity. Up to now cracks with a length of 15 mm and a height of 0.6 mm (6 times smaller cross sectional area than in Figure 4) can easily be found in flat samples. At the moment the detection of smaller defects is mainly limited by the noise caused by an inhomogenous conductivity in the sample. Fig 4a: An artificial crack (40 x 1.2 x 0.15 mm) below a 13 mm thick plate of aluminium. right: Conventional system, induction coil with a diameter of 44 mm and 170 Hz. left: SQUID system, circular excitation coil with a diameter of 20 mm and 90 Hz. Numerous measurements were carried out on original aircraft parts like wheels and multilayer structures. Additional signal structures in the magnetic field data occur when measuring aircraft parts which contain different geometrical structures or different materials like ferromagnetic steel bars in case of the wheels, or steel and titanium rivets in case of multilayer samples. To distinguish these field variations from those caused by cracks, additional data processing algorithms can be used. Fig. 5 shows the two dimensional field distribution above a multilayer structure consisting of three aluminium sheets bolted together by aluminium rivets. Close to some rivets, artificial cracks of 2.5 mm to 5 mm length have been introduced in the middle aluminium sheet. A circular coil with a diameter of 9 mm was used here for eddy current excitation. For cracks in a depths of about 3 to 7 mm, the optimum excitation frequency was about 0.8 to 1.5 kHz. A periodic pattern can be observed in Fig. 5 (centre), which is due to the distortion of the eddy current flow by the aluminium rivets. The cracks lead to a further distortion of the eddy current flow, which results in an increase in the magnetic field amplitude at positions just above the cracks. The periodic signals are eliminated by additional software filtering. Here the measured data was substracted from those of a rivet row without cracks. The new field maps contain nearly only the information about cracks (Fig. 5 bottom). We have developed a SQUID based prototype system for eddy current NDE, which can be operated in a magnetically unshielded environment, like an aircraft hangar. Various measurements on original aircraft parts could be carried out, and technically relevant cracks could easily be detected. A comparison with a conventional system showed the superiority of the SQUID system over the conventional one, due to its higher dynamic range and the substantially higher field sensitivity. The authors are grateful to F. Schur of Lufthansa, W.B.Klemmt of DASA, M.Junger of ESR-Rohmann, and Y.Zhang and H.J.Krause of Research center Jülich for supplying the various test samples and for helpful discussions. R.Hohmann, H. -J.Krause, H. Soltner, Y. Zhang, C.A.Copetti, H.Bousack, A.I.Braginski, M.I.Faley, IEEE Trans. Appl. Supercond., 7, 3702, 1997. IEEE Trans. Appl. Supercond., 7, 2756, 1997. We are grateful to Yi Zhang for supplying the rf SQUID used in our measurements. Y.Zhang, M.Mück, K.Herrmann, J.Schubert, W.Zander, A.I.Braginski and C.Heiden, Appl.Phys.Lett. 60, pp.2303-2305 (1992). Y. Tavrin, H. -J.Krause, W. Wolf, V. Glyantsev, J. Schubert, W. Zander and H.Bousack, Cryogenics, 36:83-86 (1996). M.v.Kreutzbruck, M.Mück, and C.Heiden, ECNDE98, in press.